With safety at Mosport Park not being good enough and a French-Canadian driving for Ferrari, it was decided that a track should be laid out on the roads on the Ile de Notre Dame, which had been the site of Expo 67. The man-made island was then transformed for the 1976 Olympic Games and featured a rowing basin. The work was completed hurriedly and most drivers complained that it was too narrow and that overtaking was very difficult. With the grid restricted to 22 starters there was intense competition in qualifying as 28 cars had appeared. Ensign had decided not to run Brett Lunger and so Derek Daly had two cars to himself, while Brabham had a third car available for Nelson Piquet and Riccardo Patrese was back in action after the controversial ban which meant he could not race at Watkins Glen. The lap times were very close indeed with Jean-Pierre Jarier (Lotus) taking pole by one-hundredth of a second from Jody Scheckter's Wolf with Gilles Villeneuve (Ferrari) two-tenths behind them. Then came John Watson (Brabham), Alan Jones (Williams), Emerson Fittipaldi (Fittipaldi), Niki Lauda (Brabham), Hans Stuck (Shadow), Mario Andretti (Lotus) and Jacques Laffite (Ligier). Carlos Reutemann was not competitive in his Ferrari, qualifying 11th, while Piquet was an encouraging 14th. At the back of the grid Clay Regazzoni (Shadow) and Beppe Gabbiani (Surtees) missed out by a tenth of a second as Keke Rosberg (ATS) and a troubled Jean-Pierre Jabouille (Renault) scraped onto the back row of the grid. It had rained intermittently throughout practice but the weather was cool and overcast on race day as thousands of fans crammed onto the island to see Villeneuve in action. At the start Jarier made the best start to lead Scheckter, Jones and Villeneuve into the first corner. Stuck and Fittipaldi went out almost immediately when the German spun into the Brazilian and this dropped Laffite to the back of the field as he had to take avoiding action. Further around on the first lap Scheckter drifted wide and Jones dived into second place. But Jarier was in the lead and pulling away. Further back Andretti and Watson engaged in a lively battle for fifth place, the American keen to get ahead of the Brabham. On the sixth lap Andretti made a move and the two cars collided and spun. Patrick Depailler (Tyrrell) moved to fifth but he soon had to pit for new tires and so Reutemann took the place. On lap 18 Jones began to drop back with a slow puncture and he was soon overtaken by Scheckter and Villeneuve and the Canadian then moved to second. But Jarier was almost 30 seconds ahead and Villeneuve had little chance of catching him. But on lap 50 Jarier went into the pits with no brakes. A hole was found in the system and the car was retired. Villeneuve was thus left in the lead and duly won his first F1 victory, to the delight of the local crowd. 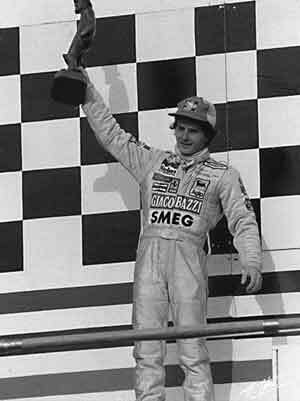 Scheckter followed him home with Reutemann third, Patrese fourth, Depailler fifth and Daly sixth.